During the Korean War, Silas C. Conine, of Ray City, served in the 7th Cavalry Regiment, 1st Cavalry Division, United States Army. Conine served as a Light Weapons Infantryman with the rank of Private First Class. Silas Cleveland Conine, a son of Ida Mae Bowen and Roland Silas Conine, was born in Berrien County, GA on October 16, 1929. His father was a turpentine laborer. 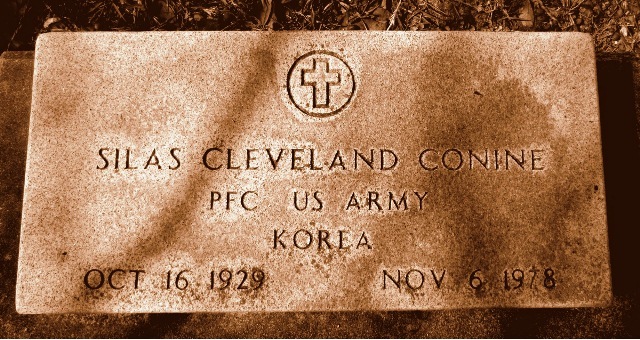 The 7th Cavalry fought in some of the bloodiest battles of the Korean War, including Hwanggan, Poksong-Dong, Kwanni, and the Battle of Pusan Perimeter. When the 1st Cavalry Division attacked north, the 7th Cavalry was in front, smashing 106 miles behind enemy lines in an historic 24 hours. The Regiment earned three Presidential Unit Citations in Korea. While fighting in South Korea, Silas C. Conine was twice seriously wounded. 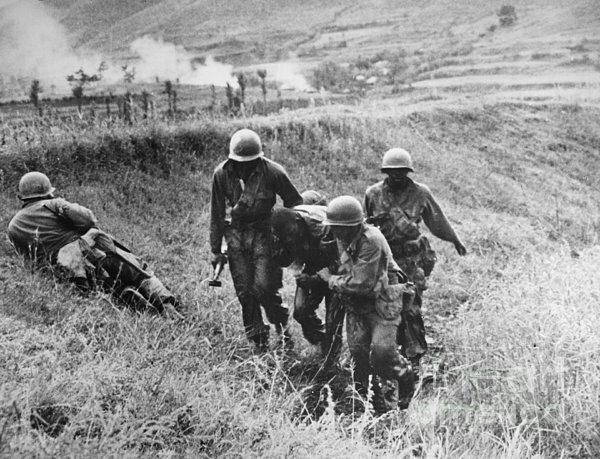 He was first wounded on July 30, 1950 about the time of the Battle of Pusan Perimeter was getting under way. The Battle of Pusan Perimeter was a large-scale battle between United Nations (UN) and North Korean (NK) forces lasting from August 4 to September 18, 1950. It was one of the first major engagements of the Korean War. The invading North Korean army, 98,000 men strong, had pushed the 140,000 UN troops including the 7th Cavalry Regiment to the brink of defeat. The UN forces, having been repeatedly defeated by the advancing North Korean People’s Army, rallied to make a final stand at the “Pusan Perimeter”, a 140-mile (230 km) defensive line around an area on the southeastern tip of the Korean Peninsula that included the port of Pusan. The UN troops, consisting mostly of forces of the Republic of Korea Army (ROK), United States Army (US), and British Army, mounted a last stand around the perimeter, fighting off repeated North Korean attacks for six weeks as they were engaged around the cities of Taegu, Masan, and P’ohang, and the Naktong River. The massive North Korean assaults were unsuccessful in forcing the United Nations troops back further from the perimeter, despite two major pushes in August and September. Berrien county’s first fighting man to be reported wounded in the Korean War, according to information given The Herald, is Pfc. Cleveland Conine, son of Mr. and Mrs. Roland S. Conine, of Ray City. The War Department informed the Conines of their son’s injury last week. The wound was said to be serious. Pfc. Conine was shot on July 30, and will be awarded the Purple Heart. He is now recovering in a Tokyo Army Hospital, it is understood. Details of how the soldier was wounded, and to what exact extent, were not available at press time today. WITH THE FIRST CAVALRY DIVISION IN KOREA. – A Ray City man serving with the First Cavalry Division in Korea has been awarded the Purple Heart decoration for wounds received in action against the enemy at Ichon, Korea. He is Private First Class Silas Conine, son of Roland S. Conine of Route 1, Ray City, Georgia, and a member of the Division’s 7th Cavalry Regiment. PFC Conine, who served for a short while in Japan as a member of the occupation forces with his unit, was wounded July 31 just outside of Ichon while carrying out his assigned duties with his unit. According to military records, Conine was seriously wounded in action by a missile attack on July 30, 1950, but he was able to return to duty with his unit. North Korean troops, hampered by supply shortages and massive losses, continually staged attacks on UN forces in an attempt to penetrate the perimeter and collapse the defensive line of the UN forces. However, the UN used the port at Pusan to amass an overwhelming advantage in troops, equipment, and logistics, and its navy and air forces remained unchallenged by the North Koreans during the fight. After six weeks of fighting, the UN forces launched a counterattack at Inchon on September 15, 1950. In another missile attack on September 17, 1950, Conine was again seriously wounded in action. This time he was evacuated and subsequently separated from the Army for disability. Under the effect of the UN counterattack at Inchon, the North Korean force collapsed and retreated in defeat. The Battle of the Pusan Perimeter marked the furthest advance the North Korean troops would make during the war. Silas Cleveland Conine returned to the United States. He died in 1978 at the age of 49 and was laid to rest at Roseland Cemetery, Monticello, FL. Grave of Silas Cleveland Conine, Roseland Cemetery, Monticello, FL.